"Think of Thorogood, Gary Moore, Wilko Johnson. In the winter months of 1994, guitarist JAMIE THYER took time out from playing on demonstrations for Marshall amplification and Rotosound strings. He began writing and rehearsing with a rhythm section under the ironic name of THE WORRIED MEN. Initially, they considered that the originality of their style and direction would place them on the outer peripheries of fashion motivated rock music, yet, because of their ability to entertain and not merely play, enthusiastic audiences, promoters and even record companies swiftly disproved this! Their live album Fear and Loathing at the Wünder Bar was recommended by Venue and AWOL magazines, and despite a lack of formal promotion, their local gigs attracted an avalanche of press and an ever-growing mailing list. As a direct result of this, THE WORRIED MEN embarked on a relentless succession of nationwide dates, averaging around four or five gigs per week at such venues as NOTTINGHAM ROCK CITY, London's famous MARQUEE CLUB, etc, alongside some of the worlds leading rock and blues musicians, including ROBIN TROWER, CHICKEN SHACK, WILKO JOHNSON, ROBERT CRAY, JEFFERSON STARSHIP, besides many others - always to an overwhelming reception. (Partly due to the practice of constantly adding to their repertoire, thereby ensuing no two shows are the same). It seemed as though a tired and jaded rock scene needed their fresh approach! THE WORRIED MEN continue touring around England and Ireland, often seen in the company of PETER GREEN, JOHNNY WINTER, NINE BELOW ZERO, WALTER TROUT, etc. 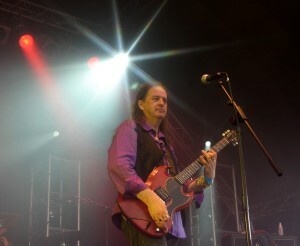 Recently, Jamie was invited to join forces with MOTT THE HOOPLE'S VERDEN ALLEN on an adventure which produced the album Love You and Leave You (Angel Air Records), taking in many gigs at top venues, BBC radio broadcasts and an opportunity to headline the main stage at Cambridge Rock Festival; each episode earning Jamie much praise, much press and many plaudits. With their new album set for release, a bulging diary and loyal supporters, there's every reason for JAMIE THYER to look forward to a future that's golden with promise!